This entry was posted in acceptance, beauty, empowerment on 26 April 2018 by Martina. 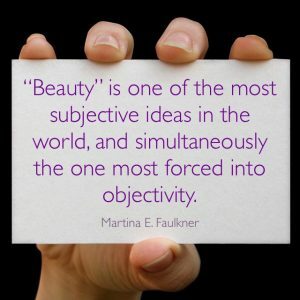 “Beauty” is one of the most subjective ideas in the world, simultaneously the one most forced into objectivity. While there was some overlap among answers (I love that ‘confidence’ came up both times! ), there was also a lot of difference that didn’t necessarily stick to a “traditional” gender divide. And that’s what’s most important here: Even among genders, beauty is defined and experienced differently. There is no one standard of beauty when you actually break it down and ask people. There are millions. And they’re all correct. Because Beauty, at its core, is individual, globally undefinable, and highly subjective. It’s the exact same with human beauty. What’s beautiful to you might not be “beautiful” to the person standing next to you, which is why it’s so incredibly subjective. I’d venture to say that it’s the most subjective idea we engage with on a daily basis, that we are taught to experience as 100% objective. Beauty, therefore, is truly in the eye of the beholder. And always – always – will be. Thankfully.